Serenity a healer, the softest dragon you'll meet, serenity is in tune with nature and gets followed by a wide variety of...Interesting creatures. She hates violence but understands it is a necessary evil. Hes a Mage and convinced the two poor Souls to do the Task by sheer Intelligent and Charme. , an honorable and all around Helpful Guy. A little to Helpful sometimes. She doesnt care what to accomplish, but if theres a Reward? You cant live from Poetry alone after all. [url=http://flightrising.com/main.php?dragon=37124370] [img]http://flightrising.com/rendern/350/371244/37124370_350.png[/img] [/url] [b][i]aradia[/i][/b] is not nice by any means. she's blunt, she's unpredictable, and can be a bit extreme in her doings. but on the other side of the coin, she's incredibly smart and crafty, and is generally relied on as a mage for defensive purposes. the only dragons she truly respects are radiant and insomnia, the clan leaders; [i]latula[/i], a thief, who keeps her company when no one else is around and helps gather ingredients for potions and spells; and [i]amana[/i], her charge, earth magician in training. some (read: [i]daycatcher[/i], the robot, and [i]zircon[/i], the front-line warrior) think she has a crush on [i]latula[/i]. theyre not wrong. she does have some inkling of attraction to the fae. in the end, her work > her feelings and she intends to keep it that way. [i]chaotic neutral. [/i] familiar: a mushroom named magliocco. it provides ingredients in case of emergency. [url=http://flightrising.com/main.php?dragon=37147506] [img]http://flightrising.com/rendern/350/371476/37147506_350.png[/img] [/url] [b][i]latula[/i][/b] is, simply put, a thief. she steals things and gives them to [i]whisper[/i], a necromancer, [i]aradia[/i], mage, or [i]kawailani[/i], her mate. she's generally upbeat and bubbly, but knows when to pull herself back. she relies on [i]aradia[/i] (or [i]whisper[/i] if [i]aradia[/i] is busy) for things like smoke bombs and other things. she does reciprocate [i]aradia[/i]'s feelings, but neither know, and even if she did know, she already has a mate she loves dearly, who she isn't planning to leave. [i]chaotic good. [/i] familiar: none- she's too small [url=http://flightrising.com/main.php?dragon=38055399] [img]http://flightrising.com/rendern/350/380554/38055399_350.png[/img] [/url] [b][i]amana[/i][/b] is as of now, the newest permanent addition to the clan. she is an earth dragon by birth, but in some odd happening, she ended up on lightning territory. 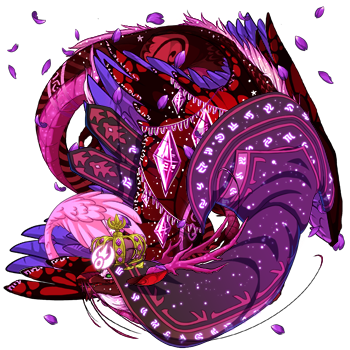 [i]whisper[/i] quickly got extremely attached, because "oh my god shes adorable we dont have an earthborn yet and shes got potential too radiant can we keep her please???" they ended up keeping her. [i]whisper[/i] and [i]aradia[/i] are co-raising her, and while neither are earthborn, they're teaching her the best they can. [i]neutral good. [/i] familiar: an earth spirit named calamity. after she was brought to the lair, it showed up not long later. aradia is not nice by any means. she's blunt, she's unpredictable, and can be a bit extreme in her doings. but on the other side of the coin, she's incredibly smart and crafty, and is generally relied on as a mage for defensive purposes. the only dragons she truly respects are radiant and insomnia, the clan leaders; latula, a thief, who keeps her company when no one else is around and helps gather ingredients for potions and spells; and amana, her charge, earth magician in training. some (read: daycatcher, the robot, and zircon, the front-line warrior) think she has a crush on latula. theyre not wrong. she does have some inkling of attraction to the fae. in the end, her work > her feelings and she intends to keep it that way. chaotic neutral. familiar: a mushroom named magliocco. it provides ingredients in case of emergency. amana is as of now, the newest permanent addition to the clan. she is an earth dragon by birth, but in some odd happening, she ended up on lightning territory. 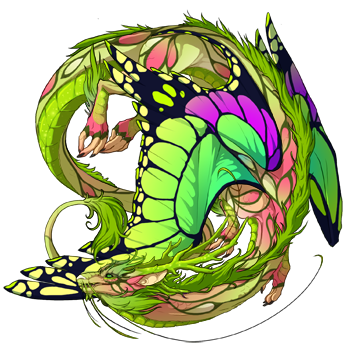 whisper quickly got extremely attached, because "oh my god shes adorable we dont have an earthborn yet and shes got potential too radiant can we keep her please???" they ended up keeping her. whisper and aradia are co-raising her, and while neither are earthborn, they're teaching her the best they can. neutral good. familiar: an earth spirit named calamity. after she was brought to the lair, it showed up not long later. Brightstone ran as fast as her small legs could carry her. Her clan mates... It was Impossible for a non-lightning dragon to leave the clan without help. All she had to do was convince the emotionless scavenger prince (who was an elemental convert) and a mirror-wolf (who thought he was a wolf) that the legends where true. Ok... easy. she got this. with an awkward flap of her wings, Brightstone broke free from the tangled forest and nearly face planted in front of her surprised clan mate. Colton didn't even shuffle, instead his calculating eyes scanned her. he finally flicked his wings in acceptance and the voice modification spoke in a high pitched tune. Brightstone tried in vain to lift herself up higher, but the sky dancer was too tall. "I found a Singer...... *Huff*.... We need to catch this other Singer..... *Huff*.... so we can rescue two other Singers.... *Huff*"
With her final gasp, she flopped back down. she seemed to have gained a small amount of his attention, but Jasper looked uncertain. the Mirror-wolf finally nodded in acknowledgment, and met her gaze. "Yes. will either of you help me?" the word slurred into a grunt, and his ear flaps flicked back meaning something only a wolf would know. Brightsone had come to know it as a loyal or affectionate acceptance of orders, but judging on how he used it, the movement had many other meanings. "thank you. what about you, Colton?" The skydancer continued to watch with vague interest for a few suspenseful seconds. and for the first time since Brightsone had known him, he tried to imitate a smile. even though his eyes didn't light up, she understood he was trying to act more like a normal dragon. But for some reason, it made her feel a bit sad. Colton was abandoning his own ways to be like everyone else. The feeling quickly morphed into frustration. of course the clan put the prophet with the two misfits. throw Castiel, Sherlock, and Snowy in an they could start a club! people the clan is constantly trying to get rid of. Jasper nodded at her, being able to read her subtle upset body language. "Yea, I'm fine. just thinking about what we have to do"
Brightstone laughed a bit in amusement, then scanned the surrounding land. "You guys remember the story of the Singers? It's not a story. 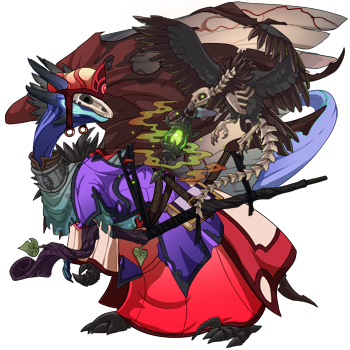 Just ran into one, and he needs our hep"
[url=http://flightrising.com/main.php?dragon=37430291] [img]http://flightrising.com/rendern/350/374303/37430291_350.png[/img] [/url] [b]Caretaker[/b] loves hatchlings. He'd do anything to save them. 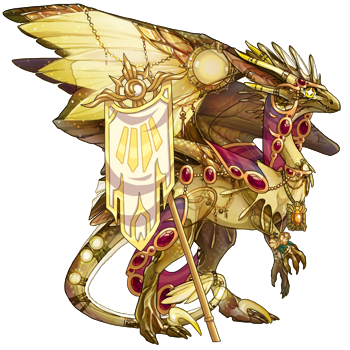 His allies are: [url=http://flightrising.com/main.php?dragon=38011670] [img]http://flightrising.com/rendern/350/380117/38011670_350.png[/img] [/url] [b]Troublemaker[/b] is known for causing problems. She thinks that she can fix that by going on this dangerous mission. [url=http://flightrising.com/main.php?dragon=38011672] [img]http://flightrising.com/rendern/350/380117/38011672_350.png[/img] [/url] [b]Nemesis[/b], her lovely sister always cares about Troublemaker, so of course she has to go on this mission too! Troublemaker is known for causing problems. She thinks that she can fix that by going on this dangerous mission. Nemesis, her lovely sister always cares about Troublemaker, so of course she has to go on this mission too! 10 hours ahead of the FR server time. Can doodle your dragon(s) for some treasure/gems! Free to use level 20 cauldron! 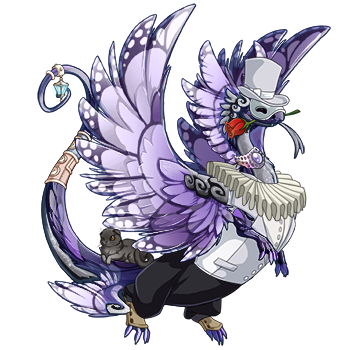 [center][b]The Scholar[/b] [url=http://flightrising.com/main.php?dragon=9291321] [img]http://flightrising.com/rendern/350/92914/9291321_350.png[/img] [/url] Cyrus, ironically a nocturne himself, is a scholar indeed. I suppose it makes sense for him to do research on his own kind and he managed to stumble upon this. Naturally stubborn and cold, even he realizes what's at stake and goes to fetch help from the soldiers of Skyhelm City. [b]The Allies[/b] [url=http://flightrising.com/main.php?dragon=25547264] [img]http://flightrising.com/rendern/350/255473/25547264_350.png[/img] [/url][url=http://flightrising.com/main.php?dragon=36179628] [img]http://flightrising.com/rendern/350/361797/36179628_350.png[/img] [/url] Reinekar and Basalt, two soldiers of Skyhelm. Reinekar is no less than the right hand of the general and more than willing to help those in need. Basalt is young and eager to prove herself and she is a good fighter too, so she get's a place in this adventure too. [/center] Here's a little snippet I wrote about this! --- Loud banging woke [b]Reinakar[/b] out of his toughts as someone was trying to make themselves heard at the garrison door. He looked around and the general, [b]Kitka[/b], just raised an eyebrow at him. The skydancer sighed, got up from his desk and walked to the door. Barely having opened it, he found himself stumbling around another dragon. "What the.. [b]Cyrus[/b]! What are you doing?" he exclaimed. There was certainly something off about the scholar, who usually was so full of himself. Now he seemed.. panicked. "I tought you were at the Observatory?" Reinekar asked, trying to calm the other dragon down, placing his claws on Cyrus' shoulders. The brown dragon took few shivering breaths and adjusted his glasses. "I.. was. But then something happened" he answered. Reinekar gestured him to come and sit, ordered someone to get something to drink. As Cyrus started to tell his tale, few other soldiers, including the general gathered to hear him. --- "So... what do you think?" Kitka asked, swirling her own glass of drink in her claws. "Do you believe him?" Reinekar was toughtful for a moment. "I don't see why I shouldn't belive him. This is a strange time in Sornieth, these weeks. Cyrus is a nocturne too, it wouldn't be surprising for his kind to ask him for help" "Yes, but it's the time where noctures do all sorts of tricks! He could be tricking us. Or if the Singers exist, they could be lying, too" the ridgeback said, not sounding too harsh, just wary. Reinekar nodded. He understood her concern, she didn't want her soldiers go running after some make-believe thing. But Cyrus still seemed upset. "If I go and take someone with me. Just me, Cyrus and someone else too. I want to check this out. If there really is a threat to whole Sornieth, it's better to stop it before it even begins" the skydancer said then, looking for his generals approval. Kitka let out a deep sigh and took a few sips from her glass. "Fine then. But please, do come back in one piece" she said. "Don't worry. I am not your right hand for no reason, right" Reinekar answered and Kitka seemed to smile a bit. "Take [b]Basalt[/b] with you. She's young, but I think she could be helpful. Go and save the world, Reinekar" the general said. Basalt already was taking steps towards them, visibly excited. The skydancer smiled, moved from the spot and went to Cyrus, to talk. 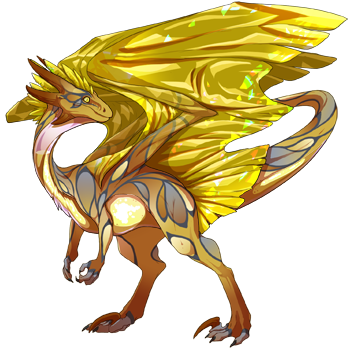 He explained a bit more and off they were; skydancer, wildclaw and nocturne. --- "How do you think this will go? Will we succeed?" Basalt whispered to Reinekar as they were flying in the night sky, following Cyrus. "We better" the skydancer laughed a bit. He then gave a reassuring look to the younger dragon. "I've taken down rogues before. And I have saved hatchlings. You can do it too. We'll succeed, don't you worry" Basalt smiled and nodded. Cyrus shouted about seeing something. Reinekar saw a faint glow in the distance too. The Singers! "No turning back now!" he said, putting a firm look on his face that Basalt copied. All three of them plunged themselves down, Cyrus and Basalt grabbing the two young hatchlings and Reinekar strinking his claws at the red nocturne, who was more than surprised about their arrival. Cyrus, ironically a nocturne himself, is a scholar indeed. I suppose it makes sense for him to do research on his own kind and he managed to stumble upon this. Naturally stubborn and cold, even he realizes what's at stake and goes to fetch help from the soldiers of Skyhelm City. Reinekar and Basalt, two soldiers of Skyhelm. Reinekar is no less than the right hand of the general and more than willing to help those in need. Basalt is young and eager to prove herself and she is a good fighter too, so she get's a place in this adventure too. Here's a little snippet I wrote about this! Loud banging woke Reinakar out of his toughts as someone was trying to make themselves heard at the garrison door. He looked around and the general, Kitka, just raised an eyebrow at him. The skydancer sighed, got up from his desk and walked to the door. Barely having opened it, he found himself stumbling around another dragon. "What the.. Cyrus! What are you doing?" he exclaimed. There was certainly something off about the scholar, who usually was so full of himself. Now he seemed.. panicked. "I tought you were at the Observatory?" Reinekar asked, trying to calm the other dragon down, placing his claws on Cyrus' shoulders. The brown dragon took few shivering breaths and adjusted his glasses. "I.. was. But then something happened" he answered. Reinekar gestured him to come and sit, ordered someone to get something to drink. As Cyrus started to tell his tale, few other soldiers, including the general gathered to hear him. "So... what do you think?" Kitka asked, swirling her own glass of drink in her claws. "Do you believe him?" Reinekar was toughtful for a moment. "I don't see why I shouldn't belive him. This is a strange time in Sornieth, these weeks. Cyrus is a nocturne too, it wouldn't be surprising for his kind to ask him for help"
"Yes, but it's the time where noctures do all sorts of tricks! He could be tricking us. Or if the Singers exist, they could be lying, too" the ridgeback said, not sounding too harsh, just wary. Reinekar nodded. He understood her concern, she didn't want her soldiers go running after some make-believe thing. But Cyrus still seemed upset. "If I go and take someone with me. Just me, Cyrus and someone else too. I want to check this out. If there really is a threat to whole Sornieth, it's better to stop it before it even begins" the skydancer said then, looking for his generals approval. Kitka let out a deep sigh and took a few sips from her glass. "Fine then. But please, do come back in one piece" she said. "Don't worry. I am not your right hand for no reason, right" Reinekar answered and Kitka seemed to smile a bit. "Take Basalt with you. She's young, but I think she could be helpful. Go and save the world, Reinekar" the general said. Basalt already was taking steps towards them, visibly excited. The skydancer smiled, moved from the spot and went to Cyrus, to talk. 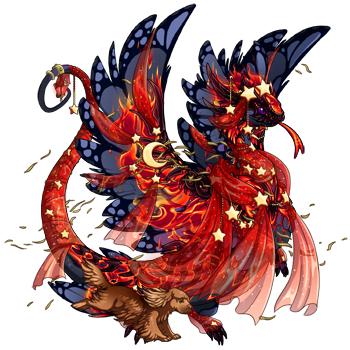 He explained a bit more and off they were; skydancer, wildclaw and nocturne. "How do you think this will go? Will we succeed?" Basalt whispered to Reinekar as they were flying in the night sky, following Cyrus. "We better" the skydancer laughed a bit. He then gave a reassuring look to the younger dragon. "I've taken down rogues before. And I have saved hatchlings. You can do it too. We'll succeed, don't you worry" Basalt smiled and nodded. Cyrus shouted about seeing something. Reinekar saw a faint glow in the distance too. The Singers! "No turning back now!" he said, putting a firm look on his face that Basalt copied. All three of them plunged themselves down, Cyrus and Basalt grabbing the two young hatchlings and Reinekar strinking his claws at the red nocturne, who was more than surprised about their arrival. [center][u][b]The Scholar[/b][/u][/center] [center][i][b]Kai[/b][/i][/center] [url=http://flightrising.com/main.php?dragon=37694643] [img]http://flightrising.com/rendern/350/376947/37694643_350.png[/img] [/url] After the encounter with the legendary Shadowsong, he rushed to his home clan and flight. As the familiar Frigid Floes came into view, he spotted his clan’s camp and landed, almost crashing. Ignoring the shocked expressions on his clanmates faces, he ran toward the main cave where the clans VanGuard meet to discuss important matters. Running past the guards on duty, he ran through the highly decorated passageways. It wasn’t long until he had finally found the Meeting Room. The five members of the VanGuard were already there, talking amongst themselves. They fell silent as soon as they saw him. Quickly, he told them what had happened, hoping they believed him. At the end of his tale, they quickly talked among themselves. They assigned Arven and Itu to accompany him. After all, one dragon can’t go on a quest to save Sornieth alone. 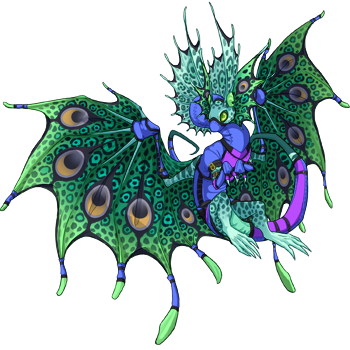 [center][u][b]His Allies[/b][/u][/center] [center][b]Arven[/b][/center] [i][center]The Explorer[/center][/i] [url=http://flightrising.com/main.php?dragon=37306555] [img]http://flightrising.com/rendern/350/373066/37306555_350.png[/img] [/url] He knows the way around Sornieth better than anyone in the clan. He’ll be quite useful if the trio ever gets lost. [center][b]Itu[/b][/center] [center][i]The Shield [/i][/center] [url=http://flightrising.com/main.php?dragon=36501801] [img]http://flightrising.com/rendern/350/365019/36501801_350.png[/img] [/url] Every team has to have their own muscle right? Well, Itu's the trios muscle. With a unlimited amount of courage, she'll risk her life protecting her comrades. She prefers to go on the defensive side then on the offensive. After the encounter with the legendary Shadowsong, he rushed to his home clan and flight. As the familiar Frigid Floes came into view, he spotted his clan’s camp and landed, almost crashing. Ignoring the shocked expressions on his clanmates faces, he ran toward the main cave where the clans VanGuard meet to discuss important matters. Running past the guards on duty, he ran through the highly decorated passageways. It wasn’t long until he had finally found the Meeting Room. The five members of the VanGuard were already there, talking amongst themselves. They fell silent as soon as they saw him. Quickly, he told them what had happened, hoping they believed him. At the end of his tale, they quickly talked among themselves. They assigned Arven and Itu to accompany him. After all, one dragon can’t go on a quest to save Sornieth alone. He knows the way around Sornieth better than anyone in the clan. He’ll be quite useful if the trio ever gets lost. Every team has to have their own muscle right? Well, Itu's the trios muscle. With a unlimited amount of courage, she'll risk her life protecting her comrades. She prefers to go on the defensive side then on the offensive. The Arch-Mage of the clan, Xonas' family rival Progenitor Atarku's. He was the first Tundra in the clan. 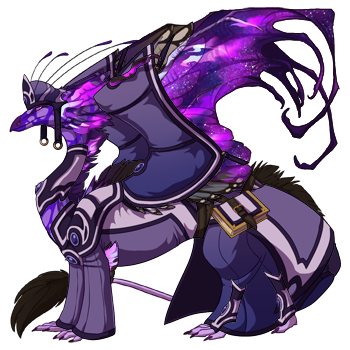 Between him and his twin sons Achinda and Griever, they are the most powerful magic users not to mention the most high ranking. Though Xonas would rather this matter be kept under wraps, Atarku has other ideas which, if refused, could be seen as defiance and an attempt to usurp the clan. A skilled fighter, Larka is Atarku's Mirror daughter but also Xonas' daughter in law; via Achinda. She did not need Xonas' convincing on this mission, and not because he is close family. On learning of the situation, Atarku ordered she assist.....and act as his eyeballs, regardless of family ties. Haex was thrilled when he got accepted into the observatory.. he brought his familiar called "Squishy" With him which was a bright blue slime he used as a "Slime of holding" he called it.. Most dragons were disturbed when they asked to borrow a pen or pencil and they were told to "fish it out of Sir Squishes" themselves.. Haex as a hatchling showed no combat promise which greatly disapointed his father Jotunheimer and was teased by his two hatch mates who were girl tundras quite brutally.. his father did nothing to stop the torment because he said "he needs to toughen up"
as Haex grew he pitted himself against his sisters like a plague dragon whenever they tried to sneak up on him.. making traps and puzzles that their combat oriented minds couldent solve.. a lot of his clan mates thought he should have been born in a lightning flight rather than a arcane flight due to his inventions.. When Jotunheimer heard his son was attacked by a nocturne he and his friend Jyggalag were quick to throw him against the ice covered walls of his special part of the den and demand as they spoke at the same time where he was attacked and what happened.. being a part of this crazy family Jotun the size of a Wildclaw turned his blind left eye to the somewhat insane guardian as he huffed.. as one thing that poisonous guardian was good for was listening in on speedily heated arguements and memorizing each part of it despite what most would witness as loud bickering white noise.. after lots of bouts of "he said this he said that" (he said/she said essencially) Jotunheimer hugged his son and held him close feeling like he was going to cry..
for once in their lives they agree'd to put their views on 'mind over matter' aside and to become a family..
Jotun took out a small elk calling horn and summoned his familiar which bugled along to the sound of his horn.. this elk.. this white elk was almost as big as him and had many points on his antlers broken off.. these two were essencially MADE for eachother is what one would say..two veterans of battle and the fight for survival working together..
"lets go..oh and Haex.. mind Gaetir.. he is a little bit blind like your old man.."
as Haex and Jyggalag walked to another part near the mouth of the cave they came to a doorway decorated with animal bones with a door knocker made from a infant troll skull.. they knocked on the door as Haex jumped back and the doorknock made grunts that sounded like an angry ape.. "come in.." spoke a voice so solemn and grieving it sounded like this was a private morgue.. as they walked in the found a sky dancer meditating in prayer facing the door with a tome of shadow levitating infront of her along with a few chests bound in chains that were jumping up and down and shacking like animals were inside of them.. Haex and his father were quite disturbed as Jyggalag walked past them shoving them aside as he rudely shoved inbetween them "aaah! My love!" he said kissing the sky dancer on both sides of her face as she smiled "aah... my dearest.. " the two seemed like they were mates but Jyggalag was quick to explain that it was a formal greeting from the part of the land of shadow Dartfrog was from..
putting her tome away the magic Skydancer adjusted her strange sitting posture and clenched the soil beneath her toes.. "so you wish to find the home of the nocturne called 'Thana'?" "I trust him with me own two toes!" Jotun sneered and spoke up "oh you mean that plague dragon who kills every plant she tou--" the Skydancer's plumage flared as she sent a blue gem flying at the Tundra as his elk dodged out of the way "Miiind your toooounge in my houuuuuussssssse!!" she said sounding like she began to speak in Parseltongue.. the skydancer calmed down and walked out of the shop the best she could "out of meh way! the tangled woodlands is safest when the light still resides touching the other lands.. for light NEVER..DARES touch the tangled wood!!" she said making a poetic morbid statement about sunlight in the tangled wood..